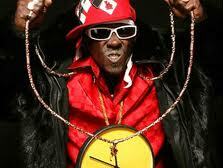 Flavor Flav, one of the founding members of Public Enemy has been arrested, again, for domestic violence. I have to be honest here and say that I have been a fan of Public Enemy for years. I also had no idea that Flavor Flav has such a long history of domestic violence and assault. I did catch the ads for some TV show where he was “auditioning” girlfriends a few years back. At that point, I shoved all my Public Enemy CDs to the back of the cupboard since I’m opposed to all forms of reality television and that’s without the level of misogyny involved in “auditioning” girlfriends. I had no idea that Flavor Flav was a violent misogynist. I just thought he was the garden-variety misogynist. I also never looked into it. I should have because his history is disgraceful. In 1991, he pled guilty to assaulting his partner Karen Ross and served 30 days in prison as well as losing custody of his children [a law the UK might want to look into]. In 1993, he was charged with attempted murder when he shot his neighbour but, apparently, he only spent 90 days in jail. He was also arrested that year for domestic violence as well as drug offences. He has also had his license and passport revoked for failing to pay child support; the sign of a real man. His arrest on October 17th, in Las Vegas, is for domestic assault and battery. Flavor Flav became a well known as a personality by wearing big clocks like necklaces, yelling out “Flavor Flav” and Yeah Boy” during performances and dating beautiful women (such as Beverly Johnson in 2000 and Bridgette Nelson in 2004). Now, I may be confused but at what point does dating “beautiful women” make one a “personality”. And, what is the relevance in an article about a man who has just been arrested for assaulting his partner, scaring his young child and threatening to kill his stepson. Celebrating a man who dates “beautiful women” is just ridiculous, even if he hadn’t just assaulted a woman. This is the problem with the Patriarchy. Flavor Flav has a serious history of domestic violence for which he has never really been held accountable. Yet, Public Enemy have been nominated for induction into the Rock n Roll Hall of Fame in 2013. Their song was used by Channel 4 to advertise the ParaOlympics and an article about his history of domestic violence also has to discuss the fact that he “dates beautiful women”; as if this somehow mitigates the violence he perpetrates. Maybe if Flavor Flav had been held accountable the first time he assaulted a woman, rather just 30 days in prison, we wouldn’t be looking at such a long history of violence.